Novelist Ruth Rendell, Author Of 'Wexford' Books, Dies At 85 : The Two-Way She is credited with being a pioneer of the psychological thriller and wrote more than 60 books. 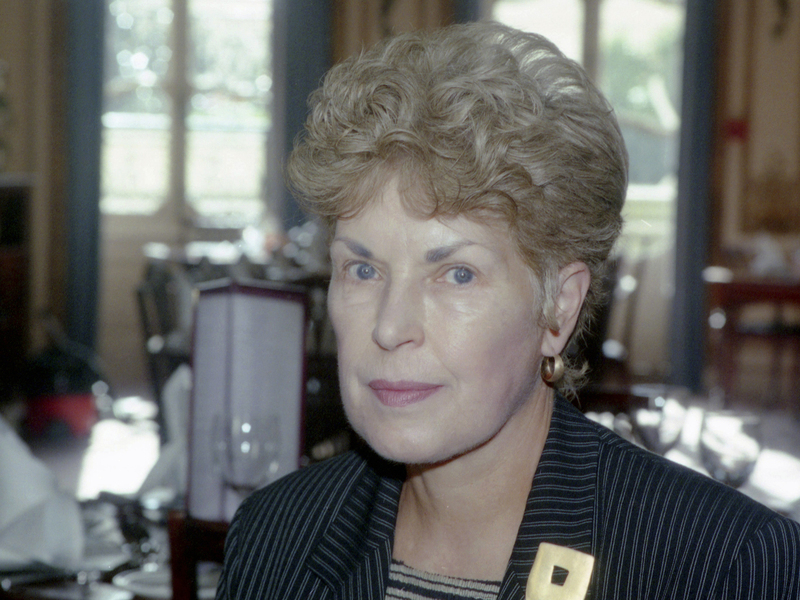 A September 1995 photo shows Ruth Rendell, in London. The prolific crime writer died Saturday at the age of 85. British mystery and crime writer Ruth Rendell — one of the most prolific authors in the genre, with more than 60 novels — has died at age 85 following a stroke in January, her publisher said in a statement. "It is with great sadness that the family of author Ruth Rendell, Baroness Rendell of Babergh, CBE, announce that she passed away in London at 8am on Saturday 2 May, aged 85. The family have requested privacy at this time," Hutchison said in the statement. Rendell was best known for creating Inspector Reginald Wexford, a character that was later translated for television, becoming a popular series on British TV. NPR's Petra Mayer says: "Rendell — along with her friend PD James — pioneered the psychological thriller. Not for her the cozy mystery, Colonel Mustard in the Conservatory with the lead pipe. Her characters were dark and damaged; unraveling her stories required a psychiatrist's couch, not a detective's magnifying glass. Rendell told NPR in 2005 that crime itself wasn't all that interesting." "I'm fascinated with people and their characters and their obsessions, and these things lead to crime, but I'm much more fascinated in their minds," she told NPR. "Her first Wexford book, From Doon with Death, was published in 1964, beginning a series of more than 20 starring [Wexford], played in the TV series by George Baker. "Many of her works were translated into more than 20 languages and adapted for cinema and TV, attracting worldwide sales of 60 million." And The Guardian writes: "Her novels, from A Judgement in Stone, which opens with the line 'Eunice Parchman killed the Coverdale family because she could not read and write,' to last year's The Girl Next Door, which sees the bones of two severed hands discovered in a box, cover topics from racism to domestic violence. They have, her friend Jeanette Winterson has said, been 'a major force in lifting crime writing out of airport genre fiction and into both cutting-edge and mainstream literature.'"